PANAMA CITY, PANAMA--(Marketwired - Apr 10, 2014) - Truly Panama, a sustainable travel tour company that has garnered enthusiastic praise since beginning operations last year, aims to introduce the world to the wonders of Panama with its official launch and a diverse collection of exciting and unique packages perfect for summer travel. Discover vibrant and historic Panama City and tour the famed Panama Canal. Take a boat ride through the rainforest and see an amazing array of parrots, toucans, butterflies, iguanas and monkeys. Discover the magic of Boquete, learn about one of the best coffees in world, soar on a mountain zip line and conquer the rivers on a water rafting adventure. Tour historic, culturally diverse Panama City and the cosmopolitan's famous Canal before heading to Anton Valley, located in an inactive volcano crater abundant in flora and fauna. Finish this great vacation relaxing at one of the world's most pristine, beautiful white sand beaches! Learn about the unique Embera tribe and journey by canoe deep into the jungle. Discover Panama City, its history and famous Canal. Cruise through the rainforest to view its many species of birds, monkeys and iguanas. This package is specially designed for couples wanting to enjoy each other as they discover our beautiful country. Stay in one of Panama City's most intimate and luxurious hotels, located within an UNESCO World Heritage Site in the historic Casco Viejo area. Next, fly to the beautiful town of Boquete, where you will visit a coffee estate and learn about how the best cup of java is produced. Truly Panama can also craft custom packages and luxury yacht charters upon request. The eco-friendly company was founded by Jonathan Zelcer and his team of tourism professionals with solid domestic and international experience in the luxury hospitality industry. For more information about Truly Panama, call (507) 398-0541 or e-mail reservations@trulypanama.com. 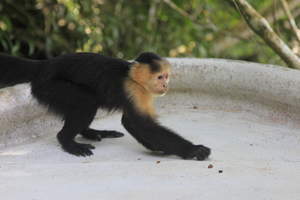 Guests love seeing the monkeys in the rainforests of Panama.